Confirmed speakers include Joseph Deng, special counsel with Baker & McKenzie; Shawn Zhao, senior corporate counsel, China, with Google; and CLP editor Phil Taylor. 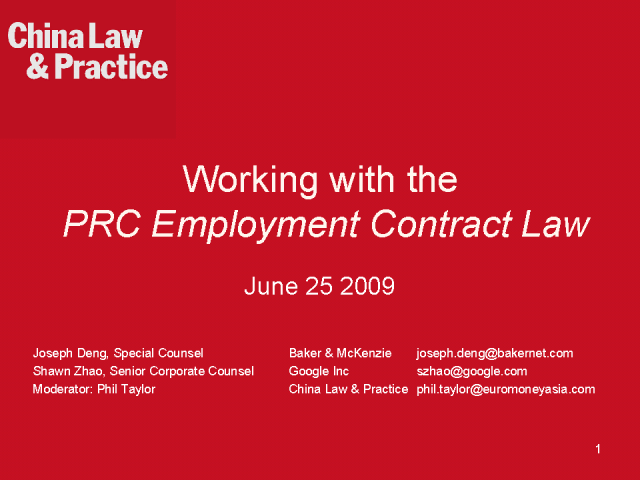 The PRC Employment Contract Law is on the minds of counsel advising companies with operations in China. The Law has strengthened the rights of employees, giving them the opportunity to take their disputes to low-cost employment tribunals. Workers are more aware of their rights and unions have increased their presence in foreign-invested companies. Companies are desperate to cut costs, but must stay legal. - cost-cutting measures for companies struggling to stay afloat. China Law & Practice editor Phil Taylor speaks exclusively with Ferheen Mahomed, regional general counsel for Asia at Societe Generale, whose team recently won CLP’s 2009 International In-house Team of the Year award. - China's rules on foreign-to-foreign mergers, as well as extra-jurisdictional enforcement. Speakers include: Marc Waha, partner of Norton Rose in Hong Kong; Simon Sorockyj, senior associate of Pinsent Masons in Hong Kong; Dr Zhan Hao, managing partner of Grandall Legal Group in Beijing. With over 21 years' experience in collating, translating and commenting on the law in China, China Law & Practice is the leading legal and risk management resource designed to help you interpret changes on the ground in China.